Family of Henry Rivera says they plan to sue for wrongful death. 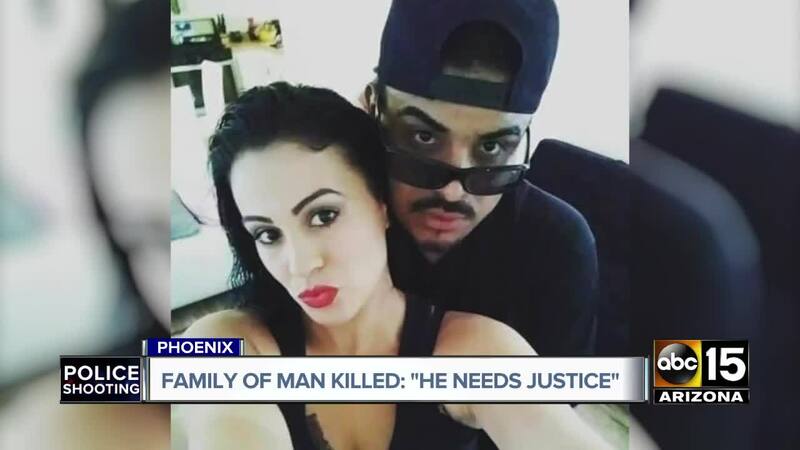 PHOENIX, AZ — A family is mourning after an unarmed father was shot and killed while running from Phoenix police. The family of Henry Rivera says they plan to sue the City of Phoenix for wrongful death. Rivera was staying at a motel when Phoenix police showed up looking for a violent kidnapping suspect. Rivera had active warrants. He took off running when he saw the officers and after a short chase, in which Rivera briefly stole a car, police shot him as he exited the vehicle. Rivera was unarmed. He was also not the suspect police believed they were chasing. Henry Rivera was 30 years old but had a lot of people counting on him. "He had four biological and then four stepchildren. He claimed us all as his daughters," said Alicia Gallo, one of Rivera's stepdaughters. Gallo was in shock when she heard Rivera had been shot and killed by Phoenix police. "I was like, ''no you’re lying,'" she said. She is still in shock. "I still kind of don’t believe it. I probably won’t until I see him at his funeral," said Gallo. The family says Rivera ran because he had several warrants, mostly for burglary and credit card theft. He had been arrested multiple times in California. Police say they chased him because they thought he was kidnapping and triple shooting suspect Eddison Noyola. "This man ran as if he was that suspect," said Sgt. Tommy Thompson with the Phoenix Police Department. "I’m told he looks very similar to the suspect they were looking for." "The only similarity I see between those two is the skin color," said Gallo. Gallo is the first to admit, Rivera was not perfect, but to her, he was "Dad." "For graduation, he bought my cap and gown. He was always supporting us." Gallo says the family plans to sue the city after the funeral. "I think he needs justice. Just because he had warrants doesn’t give a cop the right to shoot somebody. Especially if he didn’t show any harm to them. He was just running." Gallo says the family does not have Rivera's body or the autopsy results yet, so it is unclear how many times he was shot. Phoenix police have said that two tactical officers fired shots. A spokesperson for the department also stated that a witness indicated Rivera may have reached in his waistband. There is not body camera footage of the shooting. Rivera's family is raising money for funeral expenses. If you would like to donate, please visit their GoFundMe site.